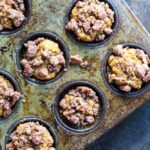 Cozy, moist and delicious mini pumpkin muffins topped with the perfect pecan crumble. Lightly spiced and sweetened with real maple syrup. Hello, Fall! Gluten free. Paleo. Preheat oven to 350’F. Line 24 mini muffins with mini muffin liners. Prepare crumble by combining chopped pecans, almond flour, coconut sugar, cinnamon, and salt in a small bowl. Drizzle melted fat over top and mix until well incorporated. Set aside. Mix together almond flour, arrowroot, coconut flour, pumpkin spice, baking soda, and salt. Set aside. In a large bowl, whisk together eggs, melted fat of choice, maple syrup, pumpkin puree, vanilla extract, and apple cider vinegar. Add dry ingredients to wet and stir until combined. Scoop about 1 heaping tablespoon of mixture into each prepared muffin tin. Spoon about one teaspoon of crumble onto each muffin. Bake for 17-20 minutes, until golden and toothpick comes out clean in center. They taste amazing warm. Enjoy! If you don’t have pumpkin spice powder, you can make your own: 2 teaspoons cinnamon, 1/2 tsp ginger powder, 1/4 teaspoon nutmeg, 1/4 teaspoon all spice, and 1/8 teaspoon clove powder. Use 1 and 1/2 teaspoons of this mixture for this recipe.